Fathers 4 Justice case ‘thrown out’ – bad prosecuting or bad reporting? 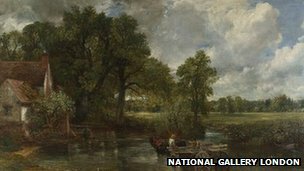 The BBC reported (on 30th September 2013) that HHJ McCreath had “thrown out the case” against Paul Manning who was accused of Criminal Damage to Constable’s classic painting The Hay Wain. The allegation was that Mr Manning, as part of a Fathers4Justice campaign, glued a picture of a young boy on to the painting. Whilst you could, if you’re a lawyer, pick out the reasons from the news report, it wasn’t particularly helpful at explaining what had happened in Court, and what the consequences were. The key to it is in the value of the damage. Criminal Damage is an either way offence – which means that it can, in general, be tried in the Magistrates’ Court or the Crown Court (see here for our post on Classification of Offences). But, if the value of the damage is less than £5,000 then it can only be tried in the Magistrates’ Court (unless it is charged with another offence in certain circumstances – it can get a bit complicated legally). Here, it seems that the Prosecution originally stated to the Court at the first appearance that the damage was £30,000. For this reason, the magistrates would have treated it as being a ‘proper’ either way offence and (in all probability) sent it to the Crown Court for the trial. What happened today was that the amount of damage (here this would be determined by the amount that it would cost the museum to fix the damage) was assessed £3,436 rather than £30,000. The result? The above provisions kick in and the Crown Court, where HHJ McCreath sits, does not have the jurisdiction (power) to hear the case. For that reason, the Judge ‘quashed the indictment’, meaning that he said that there was no power for the case to be there, and he would have sent it back to the Magistrates’ Court where the trial will happen. To me, saying that the case was ‘thrown out’ means that it was dismissed. This isn’t the case – there is no bar at all on a trial happening, it just has to happen in the Magistrates’ Court. This makes a big difference to the potential sentence however. If Mr Manning had been convicted in the Crown Court then the maximum sentence is 10 years in prison. In the Magistrates’ Court, three months. That then appears to be what has happened. In fairness the BBC is generally pretty good at reporting. It does seem here that they could have made had happened a bit clearer to the reader. This entry was posted in In the news on 30/09/2013 by Dan Bunting. This is the sort of analysis that makes this site such a valuable resource. It makes sense of the arcanae of criminal law in a way that few others can, and does so in a manner that is resolutely devoid of pomposity and in admirably straightforward language. Thank you.